The Governance Report offers new ways to understand and to govern infrastructure and other large-scale projects, especially under conditions of uncertainty and complexity. Drawing on novel survey data and case studies from countries around the world, the 2016 edition of the Governance Report examines the capacity of public administration to manage infrastructure investments, highlights governance innovations, and provides guidance for the public governance of infrastructure. Taking a proactive stance, the authors suggest governance-based solutions to some of the most persistent barriers to high quality, within-budget, and on-time infrastructure delivery. The Governance Report 2016 was part of a joint undertaking, with contributions from the Hertie School of Governance and the OECD. If infrastructure is a fundamental driver of economic growth and social development, why is it so difficult to get right? This volume makes the case for a governance perspective on infrastructure. This implies moving beyond rational economic analysis of what should be done towards an analysis of the political, institutional and societal mechanisms that shape decision-making about infrastructure investment, planning and implementation. The expert contributions dissect the logics of infrastructure governance in a novel way, providing timely analyses that will enrich debates about how to get infrastructure governance right. 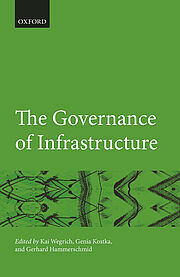 The Governance of Infrastructure is also available on Oxford Scholarship Online. Government decision-making about infrastructure is still crucial in terms of finance, regulation and co-ordination. Those decisions have to be made under conditions of uncertainty, and the complexity of the field leads to a multitude of influential actors with sometimes competing interests. Ultimately, decisions must consider political priorities rather than planning needs alone. Findings from the Hertie School-OECD Global Expert Survey on Public Infrastructure confirm the political nature of infrastructure decision-making and reveal that experts also consider the tension between political business cycles and strategic long-term planning to be the most important challenge to sound infrastructure decision-making. Subnational governments are responsible for a significant portion of public infrastructure investment, but fragmentation, co-financing requirements, complex co-ordination processes, and lack of capacity can be serious barriers to success. Findings from the OECD-European Committee of the Regions survey indicate that for smaller municipalities, external support for strategic planning and simplification of procurement processes are crucial. Larger municipalities focus on improving stakeholder co-ordination, whereas at the regional level, rigorous criteria for project selection has shown some promise. Delivering an on-time, within-budget, and sustainable infrastructure project is the ultimate goal. A major reason for failure is the systematic underestimation of risks and overestimation of benefits. In all four phases of the project life cycle–planning, contracting and procurement design, construction, and operation and maintenance–adequate risk management can help anticipate and prevent pitfalls. Strategies like performance measurement, contractor monitoring, and supervision of planners should be applied throughout a project’s life cycle. Infrastructure projects can be delivered in many different forms. A poor choice of delivery model can lead to inefficiency and waste, among other negative results. In order to establish a sound framework, countries may need to evaluate their delivery choices and identify where changes might add value. In a second step, they need to look at their specific circumstances, including government capacities and the legal environment. Only then should governments choose a project delivery model while also taking into account the project’s characteristics. To find out more, order The Governance Report 2016 and The Governance of Infrastructure. The indicators developed for the 2016 Governance Report seek to measure governments’ readiness to respond to the diverse and complex issues involved in infrastructure decision-making. Drawing on original data from the Hertie School-OECD Global Expert Survey on Public Infrastructure and other data from official sources and surveys, the indicators look at three key dimensions of infrastructure governance: planning, management and outcomes. Data from the indicators created for The Governance Report 2016 as well as any images generated by the interactive tools are free to use for research purposes. Please use the following citation: Hertie School of Governance (2016). 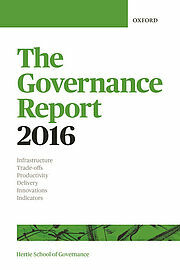 The Governance Report 2016: Infrastructure Governance Indicators. Hertie School of Governance: Berlin. The Global Expert Survey on Public Infrastructure questionnaire and data are also free to use for research purposes. Please use the following citation: Oprisor, Anca, Hammerschmid, Gerhard, and Löffler, Lorenz (2015). The Hertie School-OECD Global Expert Survey on Public Infrastructure. Berlin: Hertie School of Governance. As part of The Governance Report 2016, six cases of governance innovation were chosen to illustrate how the management of infrastructure-related public problems might be improved. A better spread of governance capacities is needed, but regulatory and delivery capacity may no longer be enough. Better co-ordination emerges as the key capacity for infrastructure decision-making. Visit our collection of governance innovations to learn more. For more detailed case studies, order The Governance Report 2016. Read more from author Genia Kostka at Handelsblatt and Capital (in German).